Digital Media Academy Summer Camp Discount Offer! Currently they have a special offer to save $75 off summer camps at Digital Media Academy with code TECHSUMMER. If you have questions about this awesome program you can call 1(866)656-3342 to speak with a Guest Service Representative or email info@digitalmediaacademy.org and mention this US Family Guide special offer. Dominos: 2 topping Large Pizzas just $5.99! 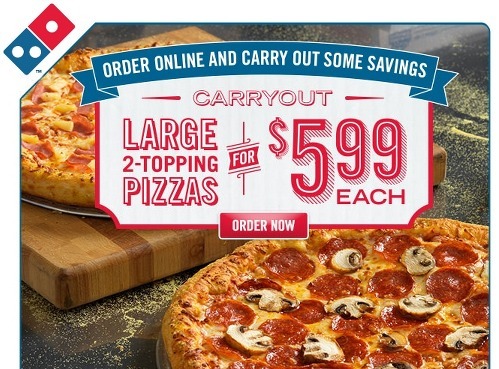 If you’re not in the mood to cook dinner you’ll be excited to know that now through May 3rd Domino’s.com is offering Large 2-Topping Pizzas for only $5.99! Just click on the banner (like the one above) on Domino’s website and place your order online. With Summer quickly approaching, you’ll want to check out this amazing price on the Step2 Arctic Splash Water Table currently on sale for just $28! This cute water table normally sells for $40+ so be sure to snag it while the price is low. 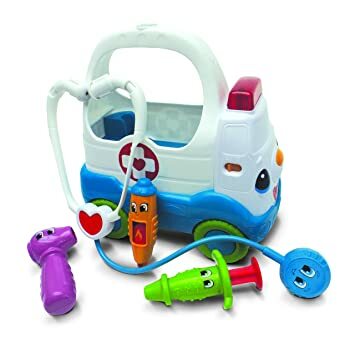 This adorable LeapFrog Mobile Medical Kit is currently 59% OFF! Highly rated Hammock with stand on SALE! TODAY ONLY there is a MAJOR sale on Vivere Hammocks! Ninja Professional Blender is 43% Off! Currently the Ninja Professional Blender is 43% off! It has a 4.1 out of 5 star rating from over 2,000 customer reviews. Darlin’ Deals Review ~ Amazon’s Fire HD6 tablet! Disclaimer: I received a complimentary Fire HD6 tablet in exchange for my honest review. I was not persuaded to write a positive review. All thoughts and opinions are my own. Thank you to Third Voice Marketing for facilitating this product for review. In this technological age there are so many ways to connect online – there are computers, laptops, smartphones, and even portable computer-type devices known as tablets. Generally speaking the more expensive an item is the better the quality. This is definitely true in the automotive industry, top of the line cars start at $30,000. However, Amazon decided to break free of the stigma that high-quality products must cost an arm and a leg (so to speak) by introducing the Fire HD6. This new device is, in my opinion, the best compact sized tablet on the market! With a display screen size of 6 inches this modest sized tablet is able to go wherever you go. Don’t let its compact nature fool you though, it has a quad-core processor and the graphics are amazing. Now I’ll be honest and let you know that this tablet is not without flaws, but for under $100 you’ll be hard pressed to find something with all the capabilities of the Fire HD6. The processing speed of the tablet while browsing was surprisingly swift; I was able to quickly navigate online and within the apps without any lag time. The screen resolution was bright and vivid as well. The crisp graphics made using the Fire HD6 tablet for viewing movies a pleasant experience and I look forward to taking it along when our family goes on vacations to keep the little ones entertained. The only downfall I encountered is the quality of the camera. While a camera is a great addition to Amazon’s tablet collection, it falls short on image quality. Additionally the camera is unable to capture a decent photograph if any movement is detected which makes photographing small children with the Fire tablet nearly impossible. I’m certain future generations of this tablet will have improved camera quality and functionality and I look forward to hopefully having an opportunity to review the upgraded tablets as well! Corduroy Hardcover Book & Plush Bear just $8! As a child one of my all time favorite stories was Corduroy. Amazon currently is offering this adorable Corduroy Book & Plush Bear for just $8.17! Digital Media Academy special offer! Right now you can save over $350 off Digital Media Academy Soccer & Tech Camps if you REGISTER BY PHONE by 4/30! To get this savings you must call 866-656-3342 and mention “USFG Soccer Discount” to register by April 30, 2015. Limited time offer – Only 10 seats available in each camp. Founded at Stanford University, Digital Media Academy is ranked as one of the ten best summer camps in the world. Digital Media Academy’s Soccer & Technology summer camps combine athletics and tech learning in one dynamic camp. Choose from Adventures in Soccer & Game Design for Boys or Adventures in Soccer, Photography & Graphic Design for Girls. Students develop real-world tech skills while sharpening their soccer skills as they train with Santa Clara University’s Division I soccer program*.